Ready to head out on the trail. 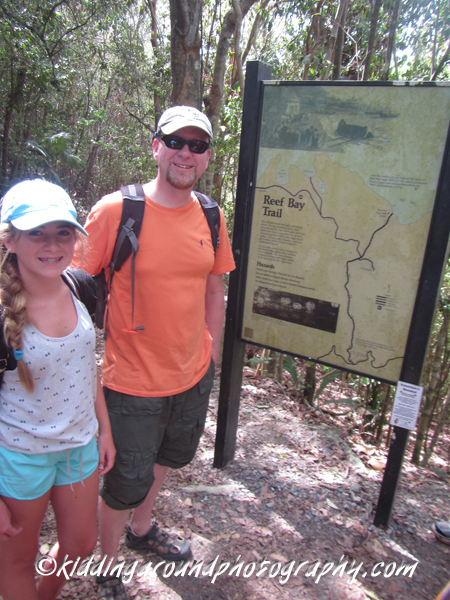 Each time we’ve taken one of our nieces on a 13th birthday trip to the USVI (we’ve taken three now), we’ve done the ranger-led Reef Bay Trail hike. This informative, fun three-mile trail goes from the top of the island down to the water on its south side (the Caribbean side). The trail goes steadily, although not too steeply, downhill all the way. The trail is rocky in some places, and is definitely not handicapped accessible. Tennis shoes, walking or hiking shoes, or even sturdy closed toe sandals are fine; hiking boots are not necessary. We have seen people in flip-flops on the trail, but it seems like a terrible idea to us! Hikers meet at the visitor center at 9:15 a.m. before being shuttled to the trailhead, and the hike lasts until about 2:30 or 3:00 p.m. You will want to bring lunch and plenty of water because the trail gets hot, especially down toward the end. Ranger talking about the history of the area. We really enjoy taking guided tours in the national parks because there’s so much to learn about these incredible places and the rangers who lead the hikes are always very knowledgeable. 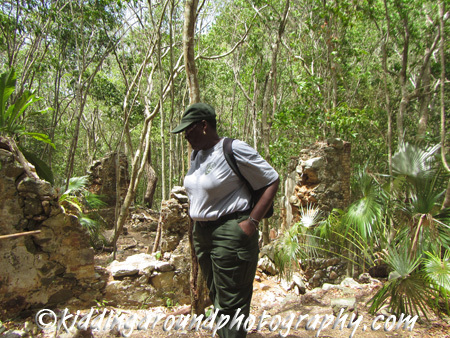 On the way down the Reef Bay Trail, the ranger provides information about the flora and fauna of St. John and lots of information about its history. The rangers have had samples of things we could smell (like the Bay Rum leaves – yum!) and taste (like West Indian Locust — also called stinking toe fruit — it actually tasted sweet but smelled like, well, stinking toes. Yuck!). They’ve pointed out Golden Orb spiders whose webs are so strong research is being done to determine whether their fibers can be used to create a kevlar-like substance, and lots of deer. They’ve shared stories of the slaves brought to St. John from Africa who built the rock walls along the trails and the plantation owners who farmed the land. And at our lunch stop, they’ve told us the stories of the petroglyphs that have been in existence for hundreds of years. At the end of the trail you arrive at an old sugar mill (look for the bats hanging inside!) and the ocean. 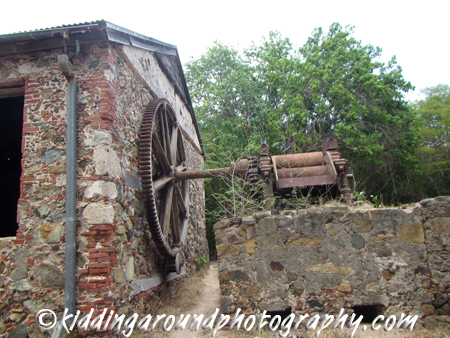 All the times we’ve been on the hike there has been time for exploring the sugar mill and doing a little swimming before the boat arrives to take hikers back to Cruz Bay (we have found it to be too turbid for good snorkeling here). 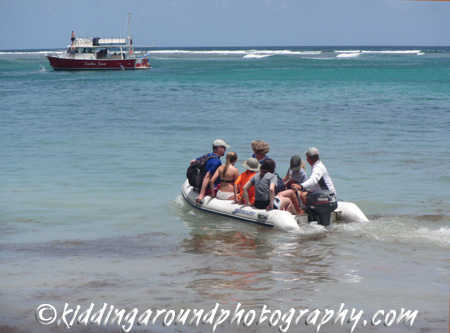 Just a short dinghy ride out to the boat for our return trip to Cruz Bay. The guided hike is offered twice a week and often fills up, even in summer, so you will want a reservation. You can make a reservation through the Friends of the Park for $30 per person. You can do the hike on your own at any time for free, but then you’d have to rent a car or take a taxi to the trailhead and hike the three miles back up the hill. More importantly, you wouldn’t get any of the information about what you’re seeing. I much prefer the guided tour and the nice cool boat ride back past the lovely rugged coastline of St. John’s south shore, even with the cost. It doesn’t look much like a forest, but it is! So many kinds of palms! Have you been on a ranger-led hike in one of our national parks? Tell us about it in the comments. Enjoy your next national park adventure, whether it’s for a week or a weekend!